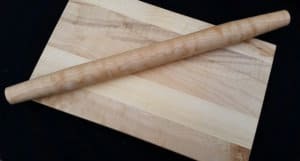 FDA’s official opinion is that both wood and plastic are safe so long as they’re cleaned well and replaced once they develop deep hard to clean grooves. 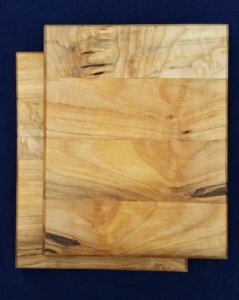 Wood cutting boards (boards made from a hard wood, not bamboo) can be sanded and then refinished with food-safe mineral oil. This eliminates the need to completely replace a wood cutting board. 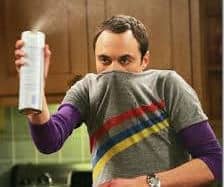 Yes, I know this has nothing to do with germs, but the feel of wood is wonderful. When we are at fairs selling cutting boards people always feel compelled to touch them. When do you feel compelled to touch a plastic cutting board? Me. Never. I would imagine that this is also the reason that Recycled Plastic Furniture isn’t as popular as a piece of regular furniture, it doesn’t really have that “home” feel! Wood Cutting boards require hand washing. Do not put a wood cutting board in the dishwasher. 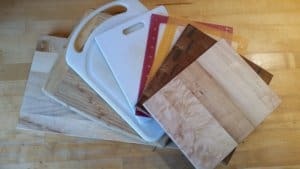 Cutting boards must be hand washed directly after use with a mild detergent and warm water and then allowed to dry to prevent bacteria from growing. Soaking in water can cause swelling of the wood and will cause any glue holding them together to break down. 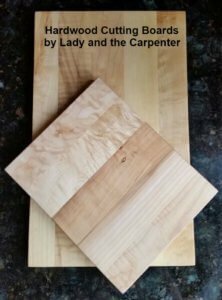 Wood cutting boards are typically heavier than the other choices. 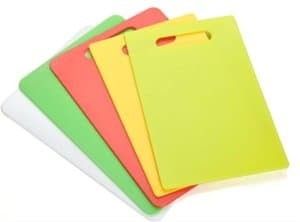 Many throw their plastic cutting boards in the dishwasher to clean them. Though this is easy to do, unless you have a sanitizing cycle you put them through at the end you run the risk of simply throwing that potentially harmful bacteria all over everything else in the dishwasher. You can find Plastic cutting boards in sets of of 4 for less than $15. A good hardwood cutting board will cost $25 or more depending on size. However, this is where you come to ask yourself… If I have to replace this cutting board for safety every time it gets grooves cut into it (see cons below) am I really saving money? And money is not the only cost to consider if you have to keep putting them in the trash. Used Plastic boards with knife- scarring can harbor bacteria. Even after a good cleaning. 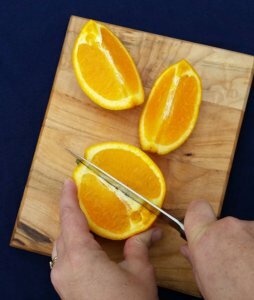 The FDA recommends that all used/ knife-scarred boards be replaced because these cuts can harbor harmful bacteria. Clivers research also supports this fact. NOTE: New Cutting boards do not have this issue. Clivers notes in his article that much research disputing this fact used only new plastic boards. It is also clearly stated in the research that running a used cutting board through a dishwasher will not penetrate the cracks in a plastic cutting board. I know, bummer right?! I love my well loved plastic cutting board. However, after discovering this scientifically backed info our white, beat up plastic cutting board was relegated to the craft drawer. I didn’t research glass cutting boards for this post for a couple reasons. First, glass cutting boards dull your knives. This was a deal breaker for me. After I found this to be true from my own experience My glass cutting board now stays in a different location and is used for other things other than cutting food. Secondly, I also don’t like the feel of it or the horrible sound the knife makes as it cuts on the glass. It was like nails on a chalkboard for me. Lastly, The research made from the wood and plastic cutting boards study can easily be applied to glass cutting boards. First of all, as you can see from the picture I have a lot of cutting boards. I don’t keep one board for meat and another for veggies. Even if I did, realistically the kids are gonna mess up that system. I promptly wash any board used for meat during food preparation and another board is used for veggies. BOTH plastic and wood cutting boards can harbor harmful bacteria if not properly cared for. All cutting boards need to be promptly washed all right after use. The much loved plastic cutting boards are being regulated to the craft area. We need to continue the practice of limiting cross-contamination by using different cutting boards when prepping meat. I don’t have a sole “meat prepping” cutting board but all long as I keep them properly cleaned than that isn’t an issue. 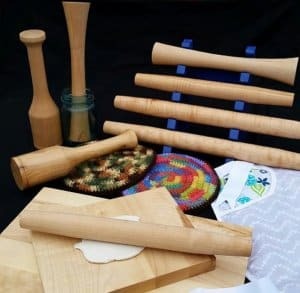 Tampers, Mallets, Rolling Pins and more…. Great post…. I have heard some of this before and yet, this was nicely put in a format that makes it very easy to see the benefits and problems with each. Thank you.